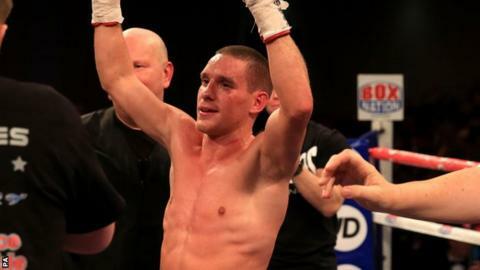 New British super-featherweight champion Liam Walsh believes he is close to competing for world titles. The unbeaten 28-year-old recorded a convincing points win over Gary Sykes on Saturday to unite the Commonwealth and British belts. And now the left-hander from Cromer will target a step up to the world title scene. "That's definitely what I want to look at. Whether I'm in the picture or not I don't know?" he told BBC Radio Norfolk. "That's probably a question for my promoter Frank Warren. My trainer says I'm not far away, but we'll see." Rochdale-born Walsh, who moved to Norfolk as a youngster, was set for the biggest fight of his career two years ago, but had to pull out of a WBO lightweight championship bout against Ricky Burns because of injuries he sustained in a road accident. He has collected the Commonwealth super-featherweight and European lightweight belts during his career, but a British championship had always been a priority. "It was a dream," he said. "It was always a title I wanted to win. It's onwards and upwards from here now." Walsh, like his featherweight twin Ryan and retired elder brother Michael, attracts a strong following from both Rochdale and Norfolk. And again his supporters were out in force at the ExCeL Arena in London, as Walsh fought on the undercard of Tyson Fury's win over Dereck Chisora. "I'm not intelligent enough and I don't have the vocabulary to tell you how much the fans mean to me. I couldn't be here without them," he said.